“The most dangerous kind of waste is the waste that we do not recognize.”- Shigeo Shingo- world’s leading expert on TPS and manufacturing process. We have often seen that MSMEs face inefficiencies due to incorrect process chains, high inventory stocking and redundant shop floor practices. These inefficiencies can be overcome by implementing good manufacturing practices such as Lean manufacturing, 5S, Six Sigma and a host of other Japanese manufacturing techniques. 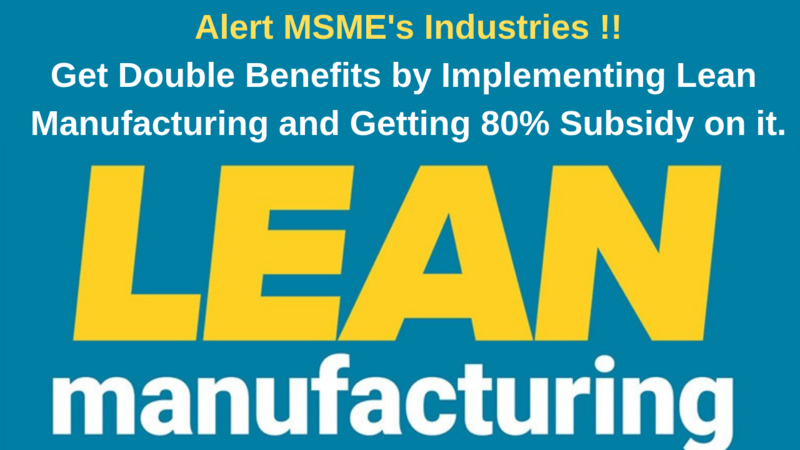 The Development Commissioner, Ministry of Micro, Small & Medium Enterprises (Development Commissioner – MSME), Government of India has announced the Lean Manufacturing Scheme to enhance the manufacturing competitiveness of MSMEs. It involves engagement of Lean Manufacturing Consultants (LMC) to work with selected MSME’s in the chosen clusters with financial support by the Government. A maximum of 80% of the project cost for each cluster will be borne by the Government, limited to the first year, of the Scheme, which would cover 100 Mini Clusters (approximately 10 MSMEs per cluster), spread all over India. 5S System: The 5S systems is a workplace organization which helps in getting the “junk” out of the work area and set of procedures to keep it that way. 5S stands for Sort, Set in order, Shine, Standardize & Sustain. Just in Time (JIT): It’s a Japanese manufacturing philosophy to make the right product in right quantity at the right time. This almost results in zero inventory and shortest possible cycle time. KANBAN System: In this, components are pulled by assembly or subsequent work centers and the containers are replenished with the right quantities by the previous work center, which reduces the inventory of unwanted components. Poka Yoke or Mistake Proofing: It is again a Japanese technique used to prevent errors occurring at their source of origin, and it finally leads to a ‘Zero Defect’ situation. TPM (Total Productive Maintenance): TPM involves operators, maintenance staff and management working together to improve overall operation of any equipment. Operators, who first identify noisy or vibrating motors, oil or air leaks, can be trained to make simple repairs to prevent major and costly break downs. Kaizen Blitz or Rapid Improvement Process: It is an intense management programme, which results in immediate change and bottom line improvement. Both management staff and workers are involved in this. The Scheme will be implemented in clusters spread all over the country. Initially in the Pilot phase, it would be implemented in 100 mini clusters and extended to more clusters in the future. A three tier structure has been proposed in the Scheme as follows. Mini cluster (MC) A Mini Cluster would be formed at the lowest local tier. The units desirous of taking advantage of the Scheme would incorporate a SPV for the purpose of engaging a lean management consultant (LMC). The units would work with the assigned LMC to implement the specific LM techniques. National Monitoring and Implementing Unit (NMIU) The next higher level tier, National Monitoring and Implementing Unit (NMIU) will be responsible for facilitating implementation and monitoring of the Scheme. Screening and Steering Committee At the highest level, SSC will provide overall direction to the Scheme and will be headed by the Development Commissioner (MSME), with representatives of the government departments concerned and industries. As soon as the bill is raised by the lean management consultant, the SPV will be paying 20% of the bill. The subsequent tranches will be paid by the NMIU to the SPV who will be paying the lean management consultant in 5 tranches as the project shall be implemented in 5 stages or milestones. Overall the program aims to help the MSMEs to implement Lean management techniques and improve their productivity.